Contigo is popular life style water bottle and travel mug brand manufacturer, known for it’s revolutionary product designs and edgy relatable content. Headquartered in Chicago, IL; all of the brand’s water bottles are BPA free and many are also made from FDA approved Eastman Tritan™. Eastman Tritan is far more durable material than a traditional plastic and helps resist against stains and odors. During our time working with Contigo, we collaborated with the brand and technology partners to outline a roadmap for implementing Salesforce Marketing Cloud Predictive Intelligence. 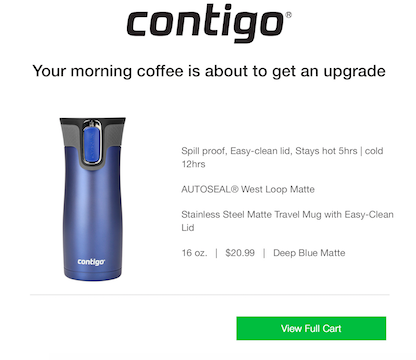 The technology allowed Contigo to cross-market and cross-sell products through both email and web channels, enabling the brand to increase product consideration and awareness. In conjunction, Brigital also collaborated with creative services to design preference centers and implement a number of automated campaigns, including; welcome, reengagement, birthday, anniversary and abandon cart campaigns. These campaigns were built to improve Contigo consumer relationships and increase opportunities for re-marketing products to most likely consumers.